We are presenting to you a beautiful and gorgeous Stylish Linen & Fuscia Pink Indo-Western Wear. Obtained from reputed manufacturers, this Indo-Western dress offers excellent comfort and attractive look. Stylish Linen & Fuscia Pink Indo-Western Wear is designed by expert designer and fabricated using fine velvet and linen. The dress is paired with a fuscia pink shimmer silk bottom having subtle patchwork on it. It is being largely demanded by the sophisticated and stylish women. 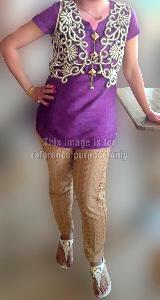 We make available Ladies Indo Western Suit Online at a fair price with doorstep delivery system all over the country.